So I've been doing this for a year now! It's a weird milestone in that it both feels like time has flown and that I've been doing this forever. I'm having such a great time and really enjoy interacting with my readers. Thank you all for being here. It wouldn't be nearly as fun without you! This is my 127th blog post. I've decided I'll share a little of what I'm up to and some of my top posts. This month I've been teaching my son how to quilt. That's been super fun so far. I'm loving participating in mini swaps on Instagram. I'm trying to finish up some WIPs (ya know, so I can start some new projects!). Most importantly and excitedly I've been able to regularly work on my projects and I finished 11 quilts in the last year since starting the blog! For reference, my first 10 quilts took me over a decade. (gasp!) I'm excited by all the inspiration on Pinterest, Instagram and so many awesome blogs! So what am I working on this week? I've cut out all my pieces for this fun rainbow inspired mini for the Rainbow Mini Swap on IG. Here's my palette. My giant wonky star quilt is pinned and ready to quilt. (It's about time... it only took me 5 months to make the quilt sandwich!) It'll be awesome to knock it into the finished column next week. Here are some of my most popular blog posts in the last year. Linking up to Needle & Thread Thursday. Posted in Quilting. 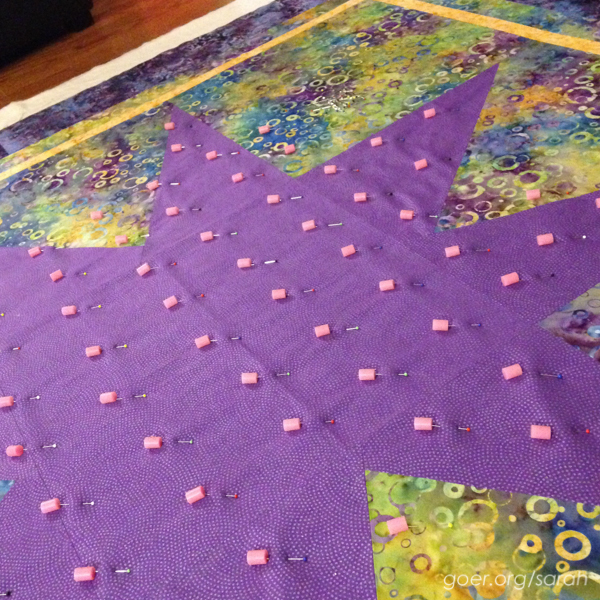 Tags: #rainbowminiswap, blogiversary, Blogiversary Scrap Attack, Stellar Wind, WIP on January 21, 2015 by sarah. Happy 1 year! Just found your site, love the bright colors I see in your posts, new follower on bloglovin'. I do love bright colors! A friend said that my Candy Shoppe quilt is my signature quilt, and I might have to agree with her. ;-) Thanks for following! A very congratulations to you on your 1st blogiversary!! I cannot believe it has been a year as well!! It's been fun!! Look forward to following you on your future adventures in the years to come!! Wow.....I'm in love with your Scrappy. I didn't know we were suppose to finish one before starting another......giggle. I'm the Queen of WIPs or UFOs. Some day I'll have another finish. Thank you, Kathy. And I miss you, too! I think about just inviting myself over for a visit. It's a bummer that I never even get over to school to visit anymore. Sarah, many warm wishes on your Blogiversary! 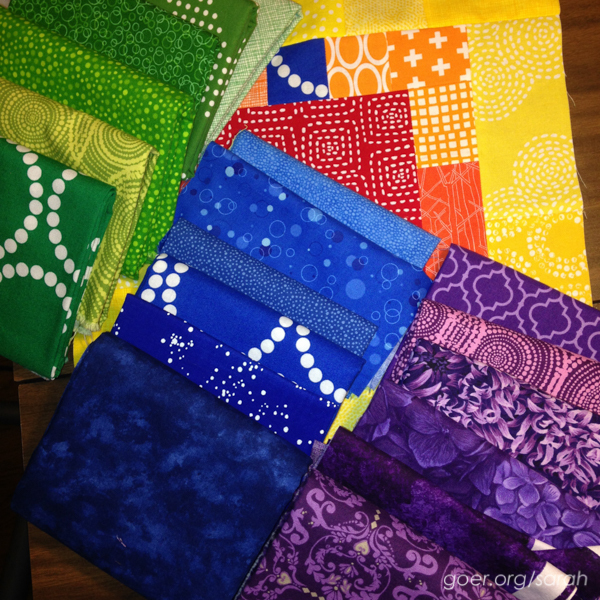 I love your color saturated mini quilt you've made for the Grow Your Blog. I'll be running into you there as I'm also participating. I found you through Needle and Thread, and I'm a new follower, too. Thank you, Julie! I LOVE My Quilt Infatuation. Her stuff is so awesomely inspiring. Did you participate in Grow Your Blog last year? Thanks for following! Congrats on your blogiversary! 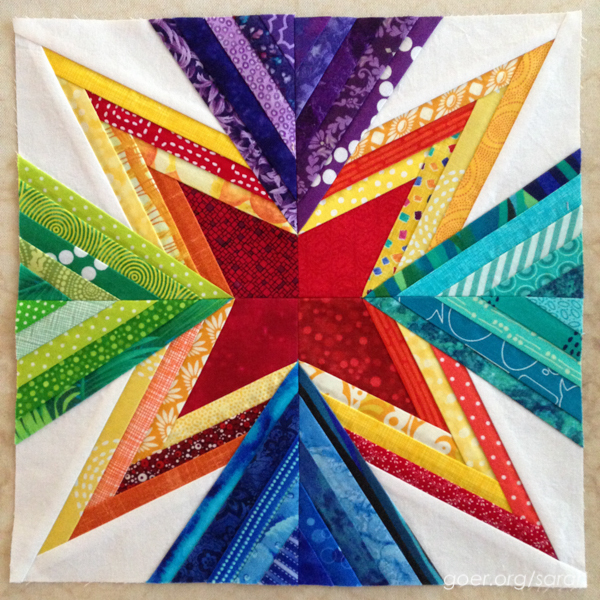 I'm excited to see how you quilt the wonky star. And I was thinking just last night I need some of your pin things. Pinmoors? Happy blogiversary! I LOVE your mini quilt!